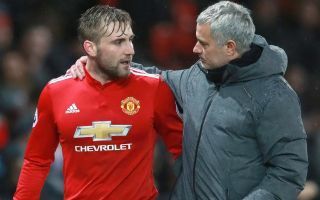 Man United manager Jose Mourinho insists that Luke Shaw has recovered from his nasty fall on international duty with England, contrary to reports. Shaw started for Gareth Southgate’s men against Spain last Saturday but was forced off during the 2-1 defeat after falling awkwardly following a challenge with Dani Carvajal. The 23-year-old has been ever-present at the start of the season with Man United at club level, featuring in Mourinho’s starting XI against Leicester City, Brighton, Tottenham and Burnley. During those matches Shaw has been arguably been the team’s standout performer, impressing supporters with his willingness to run and aggressive streak in defensive areas. Much of the defenders time at the club has been blighted by injury up to this point, but after a promising pre-season, it appears he has overtaken Ashley Young in the pecking order for selection at left-back, which earned him his call-up to the Three Lions squad during the international break. Despite widespread reports that Shaw would be forced to miss United’s trip to Watford on Saturday – as per The Express, Mourinho has revealed in Friday’s press conference that the full-back has fully recovered from his knock already and could be in line for an immediate return to his line-up. According to the Manchester Evening News, the Portuguese boss addressed the media this morning when asked for an update on the Englishman’s fitness: “I don’t know – we still have a training session. Contrary to some news, to some opinions, by the protocol point of view and according to our doctor, he will be free to play. Watford represents another stern test for the Red Devils as they look to get their season back on track with another three points, having won 2-0 against Burnley last time out. The Hornets are flying high at the top of the table with four wins out of four and managed to beat Spurs in their last home game, which means United could really do with having Shaw on the pitch to help combat any potential attacks down the right-hand side on Saturday evening.